The 45th World Championships concluded with five individual titles awarded. The queen of the all-around, Simone Biles, again won the gold on the floor exercise as she did in Antwerp last year, and also won on beam. Aliya Mustafina, the 20-year-old Russian, placed third on both of these events, and found herself unwittingly at the center of two controversial decisions where she somehow prevailed over the athletes who finished in fourth. On beam, she was completely missing her acro series, yet she found herself 0.066 ahead of the Japanese Asuka Teramoto, who appeared cleaner and had higher difficulty. She was behind the Chinese Bai Yawen, who won the silver medal to the delight of the packed Guangxi Sports Center Gymnasium. The gymnast from Moscow was again preferable on floor exercise, where she placed 0.033 ahead of the American Mykayla Skinner, who, while not beautiful in her artistry, had sported far greater difficulty. The Romanian Larisa Iordache was good to redeem her fall on beam with a performance second only to the martian Biles [note – this is meant as a compliment, with the alien reference meaning she’s so good she’s on another planet]. 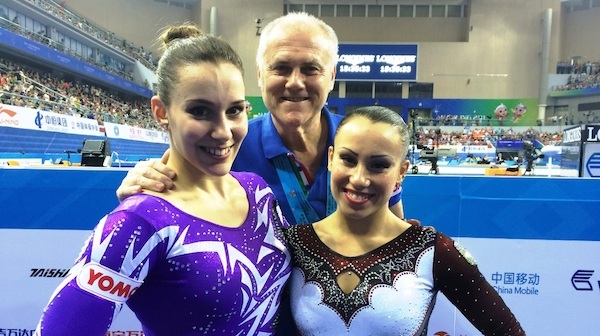 Vanessa Ferrari finished her sixth World Championships with fifth place on floor. The Lioness of Brescia was fatigued after her performances in qualifications, the team final, and the all-around final, but was nevertheless strongly determined, finishing 13 routines over seven days without error. Unfortunately, she failed to add bonuses to her start value, missing the jump after the double layout in her second tumbling pass as well as the tuck out of her full-in third pass – and so she ended up just over half a point away from Biles and just 0.067 from the podium. “Anyway, I’d prefer not to say anything more, because I wouldn’t sound very nice. It was clear how things would end up from the start, when we lined up in front of the judges,” she adds, unveiling her grudge against her eternal rival, Aliya Mustafina, who beat Ferrari in a tie-breaker for bronze in London in 2012, and who came third by just over 0.033 ahead of an excellent Skinner. Italy was the only country along with the USA to have two gymnasts among the eight best floor specialists in the world, with Erika Fasana placing seventh in the final. Her routine started like Ferrari’s, with an excellent double double, performed to the tune of the Toccata and Fugue by Bach. The 18-year-old from Brixia of Brescia lacks a fourth tumbling pass, which she has not been able to include in her routine due to a number of physical problems. She also showed some mistakes on her Memmel turn. In conclusion, President Agabio reflects with satisfaction about the World Championships because, let us not forget, the team performed well and most importantly, they pre-qualified – and looked very competitive – on the road to Rio de Janeiro. October 12, 2014 in 2014 World Championships, Erika Fasana, In Translation, Italy, Vanessa Ferrari. I have to say though that she does not sound very gracious. The scores are decided by the judging panel and not Mustafina herself. The top five gymnasts in this FX final all had a shot at a medal. It is true that Aliya’s exercise was not the most exciting. However, this does not say that it lacked difficulty. Her leaps and spins in connection with her three tumbling passes gave her a D-score of 6.2 which is only 0.1 lower than Ferrari’s. As for the E-score, I am no expert, but I find that the only thing that was “obviously bad” in Mustafina’s routine were the ever-crossed and “jiggly” legs she displayed on her second pass and her steps on the landings. I suppose they gave her the benefit of the doubt on her triple Y-turn. I found the judging ok and Mustafina’s routine a breath of fresh air in a final that was packed with tumbling difficulty. She capitalises on the CoP and dares to do something different with focusing on the dance elements instead of the acrobatics. This comment is in no way meant to offend anyone and certainly not to take away from Ferrari’s amazing performance. I just felt like I had to comment on this ever-ongoing debate of ‘power vs dance/artistic grace/…’. Ugh.. Those Italians should have just learned to keep their mouths shut by this point. How incredibly rude and off-putting they have proven themselves to be. I mean just Ferlito and Ferrari. Both were stellar gymnasts, it’s just too bad they had to say such things. The Simone comment by Ferlito was just beyond offensive and completely negates the fact that, um, SIMONE WAS LIGHT YEARS AHEAD OF HER COMPETITION AND ABSOLUTELY DESERVED HER AA TITLE. Then Ferrari being a salty biotch about Mustafina, for years lol. The looks on her face all the time, the hugging everyone BUT Mustafina, the insinuations that Mustafina was given blatant gifts rather than earning her medals, how sad. Ferrari already had a brilliant career, she had accomplished SO MUCH, to see her behave so poorly was a shame. It kinda ruined her for me, to be honest. Am I in church? because someone is speaking the truth up in here. amirak101 – you crack me up. I can’t stop giggling. And Aeuny – I understand your point about graciousness, but she didn’t say that she deserved a medal, so in some ways she is in a good position to make a critique. It would be more difficult for Skinner to say something. I also think that if people in the sport – athletes, coaches, FIG officials, etc. notice something that doesn’t seem right, they should be able to speak up. It’s a fine line, I understand that point, but the ability and freedom to speak up can improve the sport and the judging. I am biased though as I was stunned by that score. I was thinking (especially after the balance beam when Teramoto received 4th) that it really is too bad that WAG is so dominated by such a few # of countries. It must be frustrating for those on the outside looking in. I’m thinking of Popa’s face in numerous pictures this championships. I’m not saying that the athletes who earned medals didn’t deserve them, but it does worry me both for fairness, as well as for the continuation of the sport b/c these type of scores that do seem subjective (on uneven bars, beam and floor to be honest) affect fans of the sport. We’ve seen what’s happened with figure skating… those type of controversies affect the fan base which affects funding which affects the sport’s coverage which affects the ability to cultivate talent which affects the future of the sport. The FIG should pay careful attention to such a thing. I understand what you are saying, Louise. I wasn’t really expecting the result on BB either, Teramoto was clean whereas Mustafina missed a requirement and most of her connections. It is really tricky and sometimes you would like to be in the head of those judges to understand what they do. As for Figure Skating, I kind of thought that the 2002 scandal was a big wake up call, but ever since what happened at this year’s Winter Olympics, I have kind of given up on it. I still love to watch the competitions and enjoy everything about the sport, but the ISU has to make the judging more transparent or at least be able to justify what they do. The controversy over Yuna Kim and Adelina Sotnikova’s scores was a farce. It’s sad when things like that happen. I completely agree about this year’s Winter Olympics. So frustrating. And I’d love to be in the judges’ heads! I don’t like feeling so unsettled at the end of a competition, but I suppose that’s also what makes gymnastics so special and interesting – anything can happen! I’m all in for some diversity on the podium, but this sounds like mindless rant. Ferrari’s routine is quite strong considering her age, but if I have to complain about anything, I’d complain about it being actually overscored. That makes her artificially believe she should have placed higher when, in fact, she should have been given a lower score, considering all the possible deductions in her routine. Italian gymnasts are getting famous for lacking the poise and grace to accept the results, and they mostly squabble about scores they should not be given. I know it can be frustrating for them to get so close to a medal and walk away empty handed in the end, but someone should teach their coaches to build more intelligent routines and better make use of the strenghts of their gymnasts according to the Code of Points. Ferrari’s routine is built in a way that clashes with notions of artistry and her execution of some elements is considerably poor, so I wonder why the hell she is saying she deserved a better score. As a fan, I think we should not worry about the same gymnasts getting good scores, but instead we should worry about the same gymnasts squabbling about getting a higher score, even when they are wrong. I think that it isn’t scandalous that Mustafina won bronze with three tumbling passees instead of four, considering her difficult spins. Her D-score was 6.2, so her routine didn’t lack difficulty. Personally, I like her floor routine very much, because it’s a smart way to accomplish the CoP according to her abilities. Since the CoP counts the 8 best elements performed by the gymnast, whether acrobatic or dance skills, gymnasts with more tumbling passes are not supposed to earn higher score than the ones who perform difficult dance skills. In my opinion, Ferrari’s words are impolite. She admitted that she missed the connections, so it’s pointless to blame Mustafina or the judges; their D-scores became close. I perfectly understand that Ferrari was upset because she wanted to medal, as every gymnast do when they take part to a final, but this doesn’t allow her to say things like “I’m fifth, but it’s like I’m fourth, cause the third should have been far behind”. No, you aren’t fourth; you’re still fifth. It’s ridiculous. Skinner was already ahead of her, so it’s pointless to talk again about Mustafina and the fact that she got bronze. I don’t remeber Ponor blaming Raisman because of the beam bronze in London; she said “I’m the one who made the mistake”. I’m Italian and I know how a great gymnast Ferrari is, she’s the best Italian gymnast ever and her acrobatic skills are amazing, but, in my opinion, she should stop complaining in this way.